I shared my first progress report at the end of January and followed up with the second in February, the third in March, the fourth in April, and the fifth in May. Now it’s June (well, July, but you know what I mean! ), so here we go with my sixth progress report! Promoted Elbow-Length Fingerless Gloves – Crochet Pattern from Bonnie Groening. “Whew”, all right. The monthly accountability posts are a good way to share with yourself (and the world) how you are staying on target. Congratulations! Alana recently posted… Local Saturday – Are You Local? 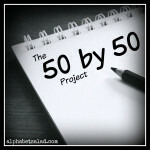 I’m enjoying your Project 50! I actually ticked off one project today, must blog about it soon!